MIRASCON has been providing insurance services for 25 years to US Military and other NATO forces stationed overseas. Whether you are on active duty, a dependent or a civilian employee, we are here for your insurance needs. Our Headquarters is located in Cologne, Germany, where we ensure that you will receive the best service at the lowest possible rates. MIRASCON will take care of your claims. MIRASCON has cooperation with several repair shops. With Sixt, nothing is impossible. We offer you a high-quality and modern vehicle fleet at low rental prices. Sixt rents top-class cars to its customers at very low prices. With the world's largest BMW and Mercedes Benz fleet, the latest models of top car makes, sports cars, convertibles, jeeps and trucks, Sixt meets the requirements of all its customers. Both private and business customers find innovative solutions for their mobility needs at many stations throughout Germany. Worldwide, Sixt also impresses with high service and product quality, customer-orientation and constant improvement. A.V.U.S.-Automobile is one of the select authorized Volvo, Jaguar and Land Rover factory agents in Germany. We specialize in tourist, diplomat, military and expatriate customers from all over the world. 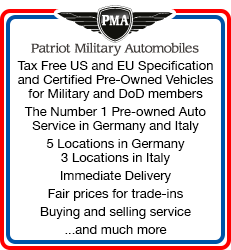 Patriot Military Automobiles offers pre-owned cars for sale. They have both US and European specification cars available. They also offer insurance and car shipping services. 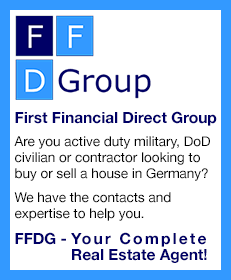 With headquarters in Kaiserslautern, they have 5 locations in Germany and 3 in Italy. With some 30,000 individual items from which to choose, ranging from small to giant pyramids, glass and metal bulb decorations, birds and flowers, intricately hand-carved figures and rare collectors' items, Käthe Wohlfahrt is the premier place to shop for Christmas decorations and other specialties. There are several shops in Germany. They can be found in Heidelberg, Rüdesheim (by Wiesbaden), Nürnberg, Bamberg, Oberammergau (2 locations) and Garmisch-Partenkirchen. There are also shops in Bruges, Belgium and Riquewihr, France. And, of course, there is the main outlet and headquarters in Rothenburg ob der Tauber in Germany. Headquartered above the Käthe Wohlfahrt Christmas Market is the German Christmas Museum. More than 200,000 guests from around the world have passed through 12 centuries of German Christmases documented and preserved in its six exhibition halls to date. Your portal to finding the best TV package to suit your needs and budget. Whether you are working in Germany, a student, or stationed here with the military there is no need to be without quality English language TV. There are over one hundred free TV & Radio channels and a huge variety of premium subscription channels available through satellite reception. With the right satellite receiver you can freeze/rewind live TV, record a whole series at the touch of a button, access an 8 day on screen electronic programme guide, independently record and watch/record different channels at the same time. From the English Premiere league to the NFL, sports fans can have their fill of premium live games and events. Just let us know what you want and we will give you the best possible solution to suit your viewing needs. Your local USAREUR CWTSatoTravel office offers you a wide range of travel services, including air reservations and ticketing, hotel, cruise and rental car reservations worldwide. In addition, the offices provide on-the-spot rail reservations and ticketing, travel insurance and unique travel packages and specials.